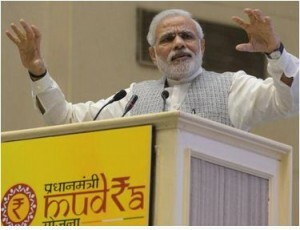 Recently Prime Minister Narendra Modi has launched Mudra Bank. Mudra (Micro Units Development Refinance Agency) will act as refinance agency for small and medium enterprise. Main objective of Mudra Bank is to provide loan to small and medium enterprise. Mudra bank is launched under “Pradhan Mantri Jan Dhan Yojana”. Mudra Bank will provide finance up to 10 Lac for small enterprise. This bank will have big corpus of 20,000 crore. This bank will also finance micro finance institutes. Boosting confidence level of entrepreneur and encouraging them to expand their business operation. Employment generation due to business expansion. More and more People will be inspired to become entrepreneur. Entrepreneurs will not be exploited by small money-lender. Mudra bank will boost economy and will assist poor to work their way out for poverty. Main product of MUDRA will be refinance for lending to micro businesses/units. This refinance will be done in three stages based on growth and funding needs. Following Businesses/Enterprise will be covered for this product offerings. Small Business Proprietorship/Partnership, Small Manufacturing units, Shop Keepers, Fruit/Vegetable seller, Hair Cutting Saloon, Beauty parlor, Transporter, food services, hawkers, repair ship, machine shop, food processor, professional and service provider. As per me establishment of MUDRA bank is welcome step. Mudra will give multifold benefits to us. It will not only help aspiring entrepreneur, it will also boost economy with overall business growth. Going forward we need to see that how effectively MUDRA concept is jellying up and helping entrepreneurs. Pls go through following link to know eligibility. Get in touch with Nodal Officer for Mudra for getting loan.